How we define, beauty is a constantly evolving process. It takes a moment to look outside the box of our last sixty years in recent fashion history to see this. Along with the direct correlation that society’s idea of beauty connects to the newest movements in fashion. Modeling originated in the art world. We see transitions from a Greek muscular ideal to the Renaissance where women were glorified for their full figures and round belly and hips. That was a sign of wealth and comfort the skinny and tan meant she was poor and working in the fields. In the 16th century, the corset came into fashion, and small waists being sought after until 1860. Then in the 1950′s the voluptuous 5’4″ Marilyn Monroe hit the scene. By the sixties, fashion evolved to 5’4″ Twiggy and bare bones. The continual evolution to the taller version of thin. To current day and now we see rebellion even to ultra thin and tall, to the point where mainstream shows have started turning away gaunt figures. As a whole it is blatantly evident that the fashion industry creates ideals outside of the every day because visuals attract more attention when they are of something rare and less commonly seen. If how we define beauty follows fashion, and it’s connected to our objection that petite women aren’t used in the mainstream, as well as petite high fashion being almost impossible to find. Now it is the time to send positive vibes out there to all the fashion designers who have just been itching to get petite lines out into the marketplace. What we know is fashion alters due to market response. Petite women have to demand it, show it off and support those who are selling petite fashions, using petite models in editorials and their magazines (unlike Vogue and Elle). Our action will cause an immediate surge and shift in the focus of who is needed on the runway, featured in commercials, media campaigns, and all magazines, especially fashionable publications! Join us today and be part of the petite fashion and model movement. 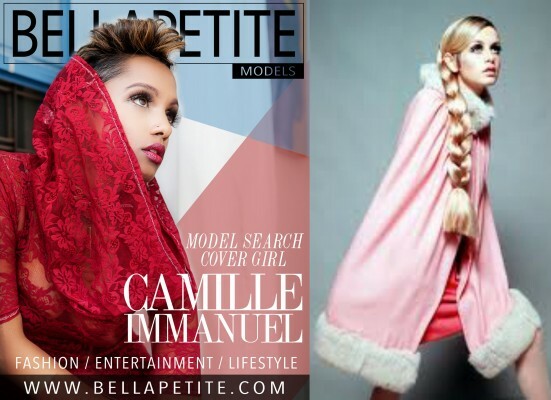 Bella Petite Magazine is Fashion, Entertainment and Lifestyle for Women. “Petite is fit, curvy and plus-sized.” Free to join us! BELLA PETITE MAGAZINE Enter the Bella Petite Model Search. 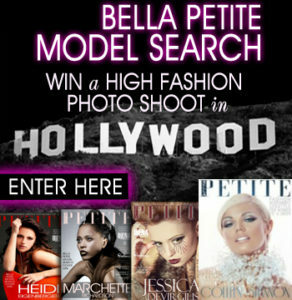 WIN a photo shoot in California, editorial fashion spread and tearsheets for your portfolio and model promotions!